August 20, 1920: “September 12, 1920: “NOTICE FOR PUBLICATION –Department of the Interior—U.S. 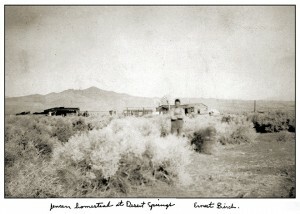 LAND OFFICE at Independence, California, August 18, 1920. 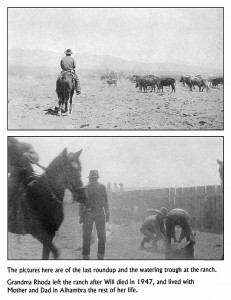 Notice is hereby given that Charles Koehn of Saltdale, California, who on August 6, 1914, made Desert Land Entry No. 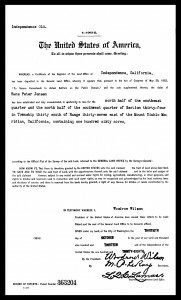 03880 for NW 1/4 of NE ¼ section, 28, township 30 south, range 38 east, Mount Diablo Meridian, has filed notice of intention to make desert land final proof to establish claim to the land above described, before United States Commissioner, at Bakersfield, California, on the 3rd day of September, 1920. Aug. 1 to Sept. 1 Inc.
February 12, 1912: “CONDITION OF MUNSEY SERIOUS –HAS THREE RIBS BROKEN AND DOCTOR HAS TO OPERATE—Randsburg, Feb. 9. –G. W. Munsey, an old settler of Desert Springs, 20 miles west of here was bucked off his horse here Wednesday afternoon while starting for home and received injuries of such serious nature that his recovery is doubtful. 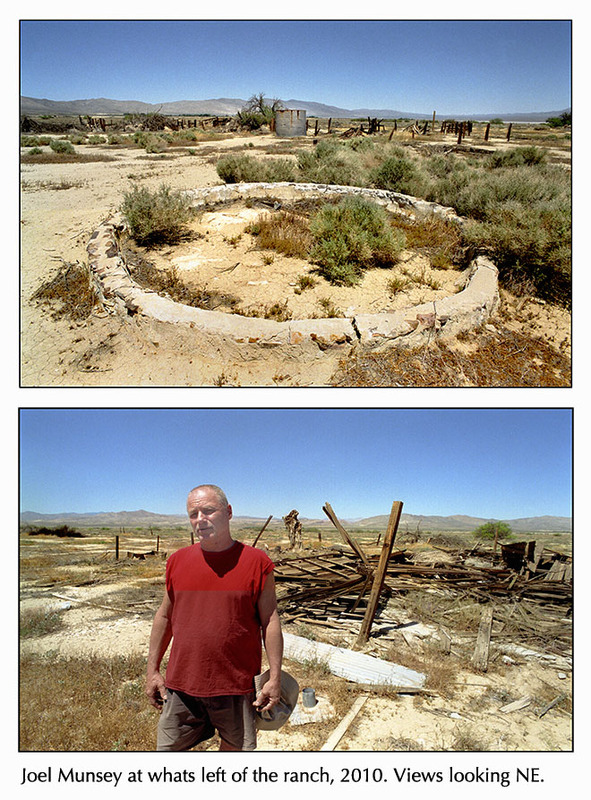 Mr. Munsey has been a resident of his desert ranch for the past ten years, having acquired patent to his homestead several years ago. He devoted his time principally to stock raising. He has a small orchard and garden on his place in a very thriving condition. 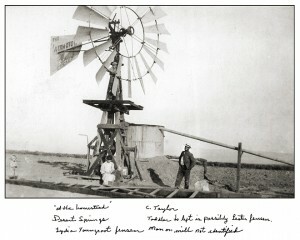 Irrigated by water supplied by his windmill. 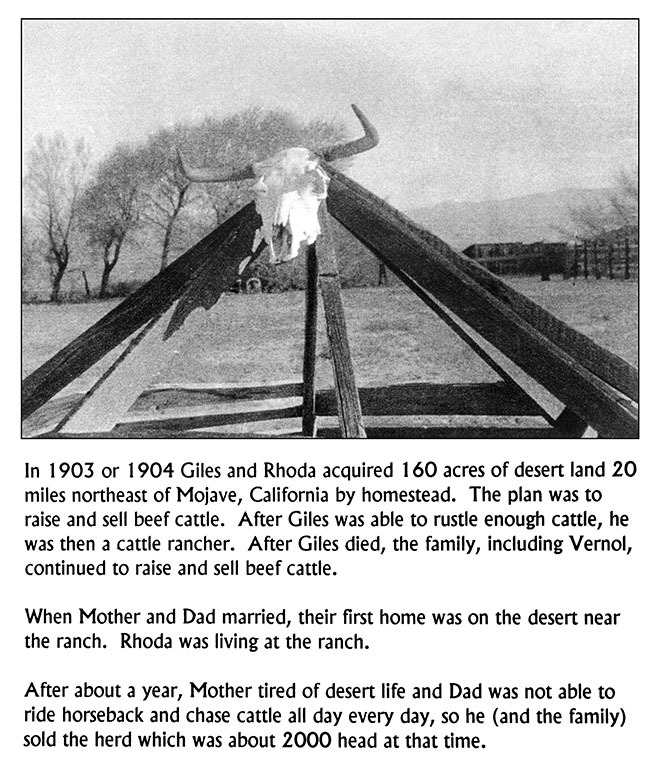 FEBRUARY 14, 1912: “INJURIES FATAL TO GILES W. MUNSEY – Well Known Desert Pioneer Succumbed Early on Tuesday –Randsburg, February 12.—Giles W. Munsey, the well-known desert pioneer, who was injured here last Wednesday, when he was thrown from and trampled by his frightened horse, died early this morning from his injuries. 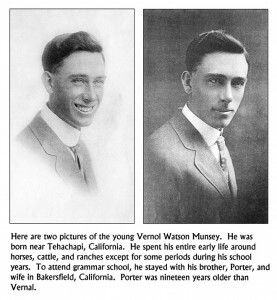 With him to the last were his wife and three sons, E. P. Munsey of Bakersfield, Vernal Munsey and Will Munsey who reside on the ranch at Desert Springs about 20 miles from this place. 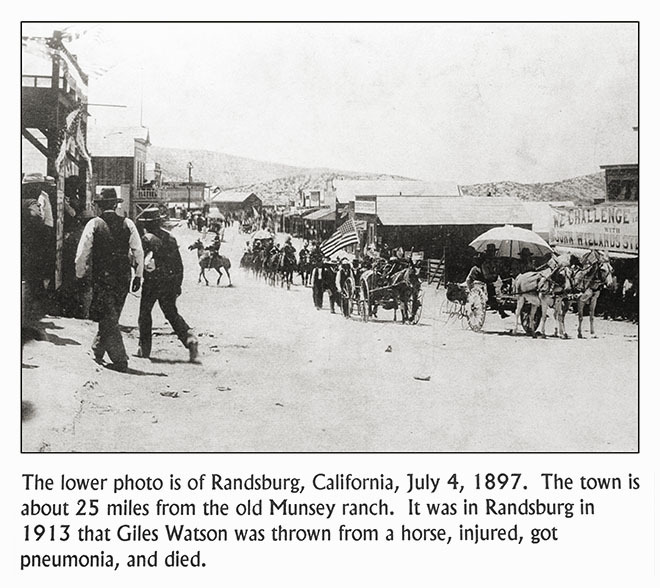 Mr. Munsey received injuries to his chest, several of the ribs being crushed by the horse’s hoofs and an operation was performed in the hope that relief might be obtained, but to no avail. 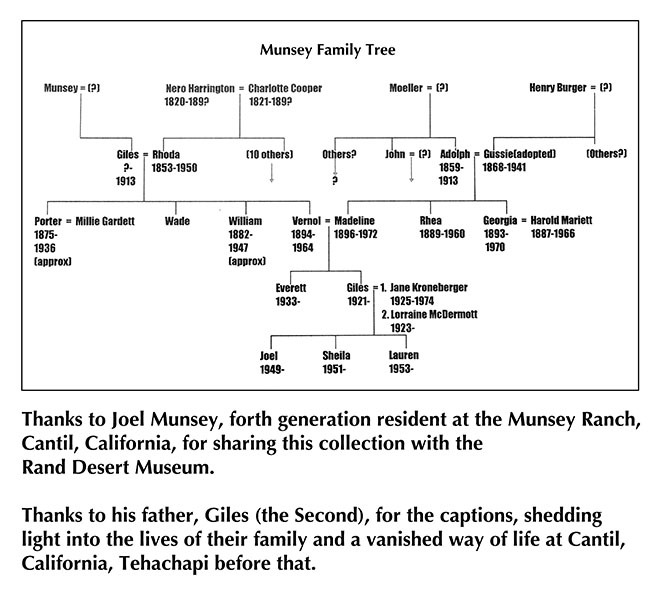 Mr. Munsey was 62 years of age and had resided in Kern County for many years. 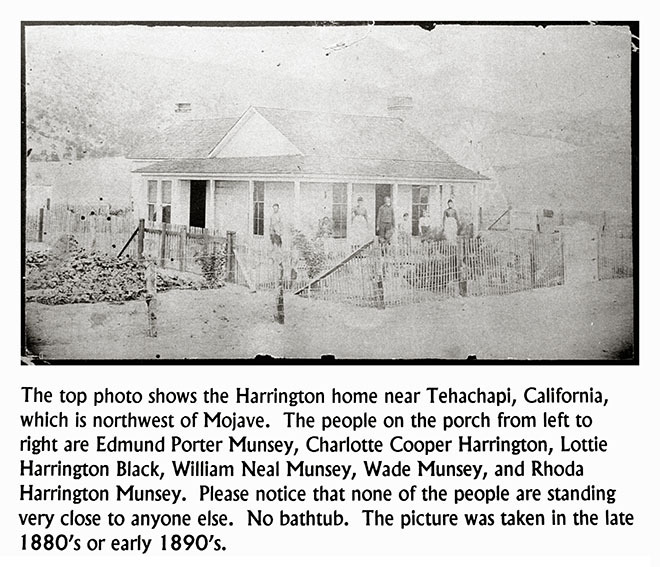 He formerly lived in at Tehachapi, but some years ago removed to the desert where his abode is one of the desert landmarks. Prior to coming to California Mr. Munsey followed mining in Nevada, Arizona, and northern California. Accompanied by his wife and children the body started for Bakersfield tonight via the Santa Fe and will reach Bakersfield in the morning. Payne & Sons will take charge of the remains but the funeral arrangements had not been completed when the funeral party left Randsburg. November 18, 1914: “DEVELOPMENT WORK IS GOING STEADILY IN FREMONT VALLEY –Development work is progressing steadily and new settlers are coming in and buying land according to the Fremont Valley News, a paper published in the interest of the great project involving the colonization of 100,000 acres of land under way and a string of 40 wells are planned for the colony irrigation system. A new hotel is in course of construction at Neuralia, destined to be the center of the agricultural development on this part of the desert. 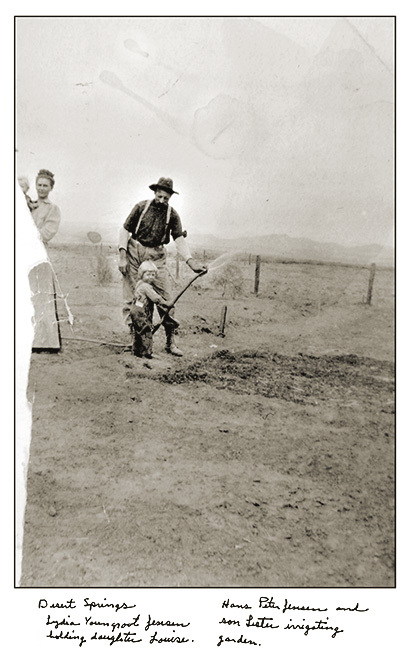 MUNSEY FAMILY ARE PIONEERS –The Munsey family are the pioneers in the Fremont valley and the success of this family in raising fine beef stock is illustrated in a picture that is printed of the valley, showing a stream of water flowing from a pumping well, fat cattle and alfalfa in the foreground and the grazing lands of the foothills in the background. In the picture is seen a 16 month old steer that weighs 1000 pounds and is valued at $60 in the Los Angeles market. The cost of production of beer on this ranch is at a minimum and it is estimated that the steer represents an outlay of not over $5. 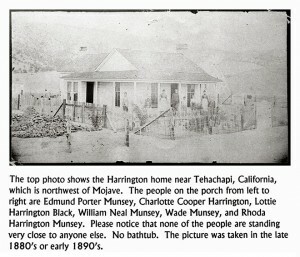 William Munsey’s home is also shown in the illustration. 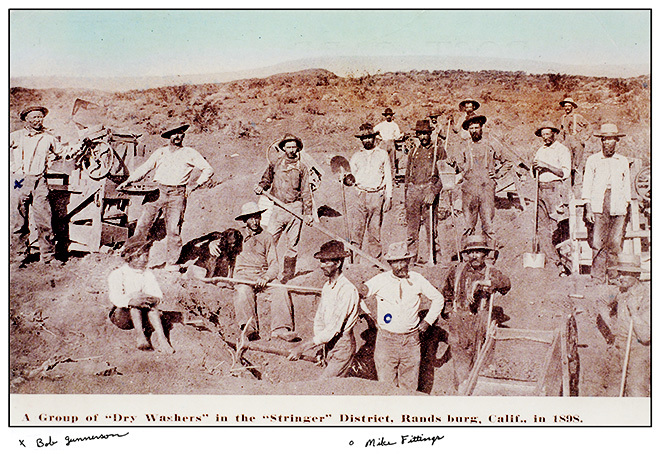 May 27, 1915: “WILLIAMS CLAIM IS RICHES IN DISTRICT –Prospectors from many parts of the county are flocking to Long Pine Canyon, fourteen miles northeast of Mojave, where Hamp Williams has truck gold bearing ore running $1000 to the ton as previously announced the volumes of THE CALIFORNIAN. 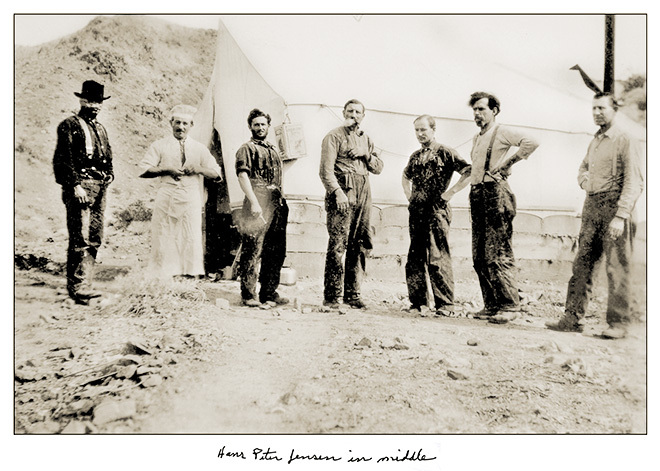 Williams is a mining man who formerly operated in the Amelie district. William Munsey of Nerglia (Neuralia) reports that William’s claim includes one of the richest high-grade strikes ever made in the county. It is located on the aqueduct branch of the Southern Pacific near Cantil station and not far from Jawbone Canyon where mining properties have been profitably developed. March 26, 1916: “THE RED ROCK CLUB met at the Levi Giddings home with 41 members present. 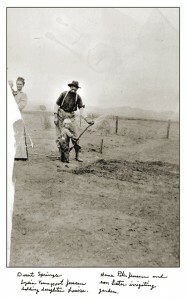 It was stated that (bondsmen) had been secured for the expense of accuring viewers for the installation of culverts and that the road petition had finally been completed in every detail, all the necessary signatures had been made before a notary and the entire document sent in to the county supervisors. Work will begin immediately on the south and near Neuralia. It has been stated the Cantil postoffice is being held back because no site for same had been secured. Hot coffee and pies, pies, pies constituted the refreshments. The next meeting will be held on Tuesday night. March 25th and will be a birthday party for Miss Viola Elliot, the club having been there by her parents Mr. and Mrs. J. N. Elliott. April 2, 1916: “RED ROCK NEWS –Thursday night the club laid aside all business matters in order to give all the evening over to the pleasure of celebrating four birthdays which all fell on this week, as follows: F. O. Alice, March 27; Miss Viola Elliot, March 23: Will Munsey, March 30; Frank Jarvis April 1. Miss Elliott’s birthday took precedence over all the rest and the 28th was chosen for the celebration. Miss Elliott, the foremost among the guests of honor being sweet sixteen, received beautiful present(s) from her friends. She wore a pretty ping silk frock with lace trimmings. All four birthday guests received the congratulations of the club members. November 26, 1919: “SUMMONS GRAND JURORS TO REPORT DECEMBER 15 –The 1919 grand jury was drawn from the jury wheel yesterday in Deparment One by Clerk Charles R. Wilkes. Judge J. W. Mahon directed the jurors report to his department at 10 o’clock, Decmember 15. 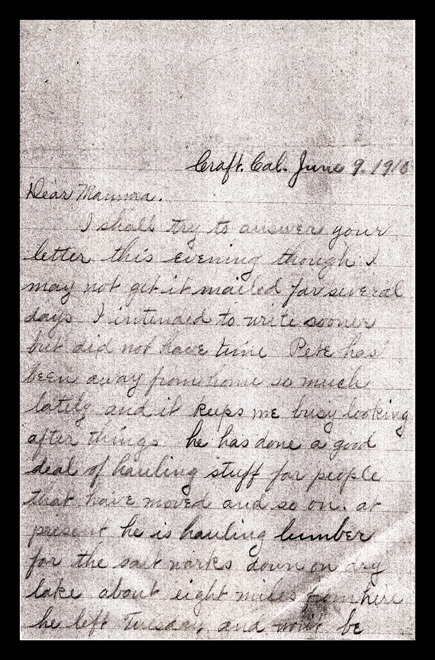 LETTER FROM MRS. H. P. (LYDIA) JENSEN TO MR. A. YOUNGROOT, OSAGE CITY, KANS. POSTMARKED: ATOLIA JAN. 15, 1908. Have received both yours’ and mamma’s letter and will answer them together, that is if I can stay with it long enough. I had to get Lester a pencil and paper too so he could write. The baby is busy sucking her fist and Pete is trying to read the paper. It is a fine moonlight evening outside and warm too. It doesn’t seem as if we were going to have any winter at all, it is nice to have such fine weather all the time but think a little snow would do us good. We spent Christmas at home, didn’t even go in for the doings at the Union hall on Christmas eve, but I don’ think we missed much. 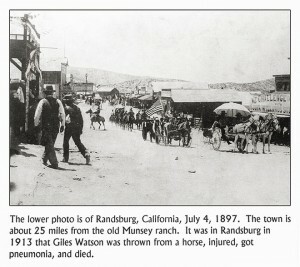 Randsburg has had hard luck, so many have died from pneumonia this fall. Well as is usually the case something happened when I wanted to write, here three more days have passed and my letter not finished but will make another attempt tonight. The rest of the family are tucked in bed. Hope they will leave me in peace for a while. We had quite a rain this morning and the wind has been busy blowing all day. Maybe we will get some winter now. We had company Saturday and Sunday evenings. 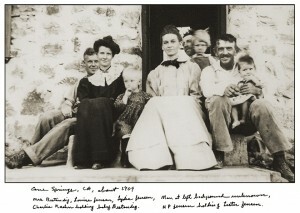 Mr. and Mrs. Greenwood and the Taylor family. They came over to hear our phonograph, which we received a week ago. We sent for it over four months ago, but it has took a long while to get here. It has two horns and I think the best machine I ever heard. We have only eight records as yet but have a dozen more coming and when they get here we’ll have music the back (Bock?). 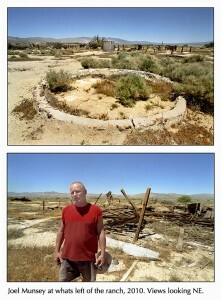 Pete was down to our ranch a few days last week and put up a telephone so we can talk to Neils whenever we want to. Pete and Taylor have taken up another half section of land there and if they can get artesian water on it our fortune is made. They have borrowed a well digging outfit and expect to go down there again in a week or so and dig a few wells. The land itself it good and most anything will there providing we get the water to irrigate. We would prefer to sell our house as it would be quite a job to move it so far and there is not telling when the mine will start up again. We won’t know for some time. 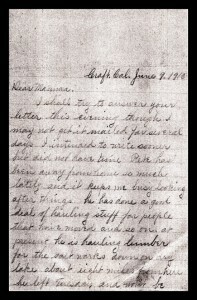 I had a letter from Elmer a week ago, he had seen Edna at Barstow on her way home, so I guess she it settled in the Osage ways again by this time, and have told you everything about us that I have forgotten to write about. Have Elmans left yet? So sad to think Mrs. Aug. E. J. had to die and leave her little children. Who has taken them? Yes, I remember that Miss Carlson, she was there at Johnson’s when I was home. 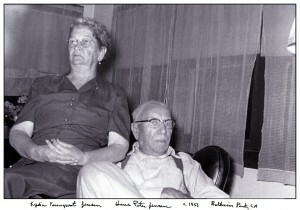 JOHNSON, H. P. JENSEN, SEATED. Unknown date. Lester’s cap came in just right as he needed one, the baby’s is too big, but she has nearly chewed up her rattle. I sent you a skirt, Bertha, hope you have received it. Minnie gave it to me two years ago but as I had no use for it, though maybe you could. I was tired of having it in my truck. Well Bertha, I hope by the time you graduate you will know how to make better P’s than you do; they look like a j, c? Tell Edna to write and tell me about her trip, as I have heard nothing of them since they left. We are all well as usual and send greetings to you all at home. 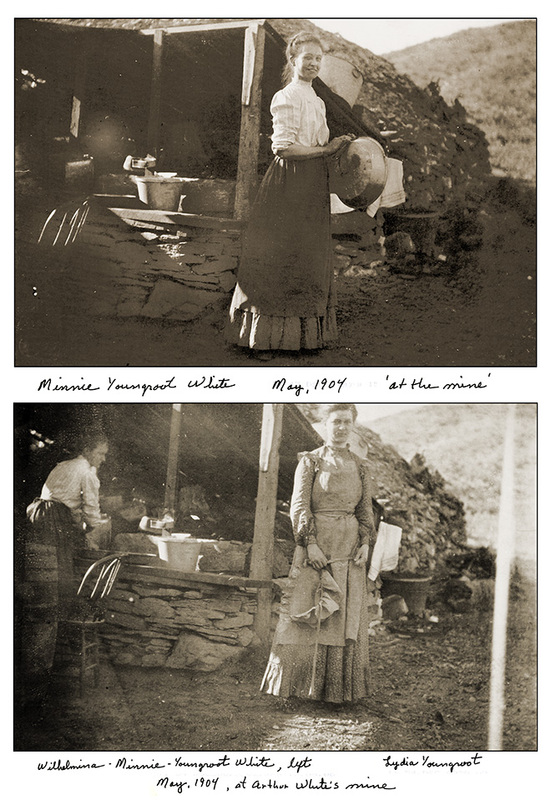 MINNIE YOUNGROOT WHITE, ‘AT THE MINE’, MAY, 1904. Lower: WILHELMINA – MINNIE – YOUNGROOT WHITE, LEFT, LYDIA YOUNGROOT. AT ARTHUR WHITE’S MINE, MAY, 1904. 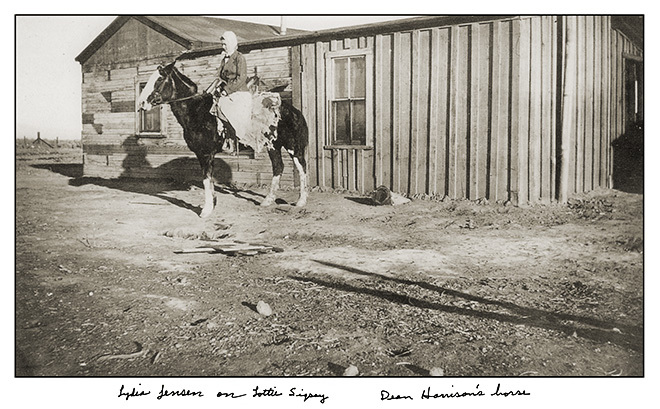 LETTER FROM MRS. H. P. (LYDIA) JENSEN TO HER SISTER MRS. HAWLETT (EDNA YOUNGROOT) . HAND CANCELLED POSTMARK WITH NO PLACE OR DATE. Good evening Mrs. Hamlett, how are you? Don’t it seem funny to be called Mrs. instead of Miss: I received your letter a few days ago, glad to hear from you and that you’re at last afloat in the sea of matrimony. Hope you won’t meet with any shipwrecks but always have smooth sailing. I would very much like to visit you in your little flat and hafve en pa-tar and meet my new relation but I guess I’ll have to postpone that for a while. Don’t wait too long before to take your family on a trip out to Calif. Or you’ll never get here. Of course you haven’t forgotten that today is your birthday. You have someone else to spank you now instead of Pete. What is Jofus doing now and how much older than you is he—if it is any of my biz—I had a conflab over the phone a couple a weeks ago with Jim Conners, he asked after you. I told him you were married and he asked if it was to the swede. I spose Elmer and his Ethel will be the next one to settle down they seen to be as thick as flies round a molasses barrel. Does Bertha over have nay beaus? I never hear of any. The children are fine and doing well, Louise is getting so big and fat and my chatterboxes and mischiefs and they sure can make the bread and butter fly. Dean Harrison stopped here over night week before last, he was going to Frisco. Guess he’ll be back this way again before long. The weather has been fine here lately but the nights are getting cold. We haven’t put up the heating stove yet, when it gets too chilly to stay up in the evening, why we crawl to-bed, and which I think I better do now, so will close for this time with best wishes from us all to Joe and yourself. I shall try to answer your letter this evening, though I may not get it mailed for several days. I intended to write sooner but did not have time. Pete has been away from home so much lately and it keeps me busy looking after things. He has done a good deal of hauling stuff for people that have moved and so on. 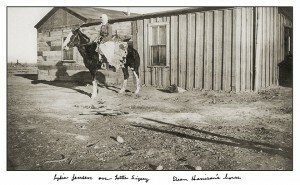 At present he is hauling lumber for the salt works down on dry lake, about eight miles from here. He left Tuesday and won’ be back till Sunday and I guess he will be home only a day or two and then go back again. This job will last him a month or more, but I told him he’d have to get me another man if he was to be gone that long, for I don’t like to stay alone, it is lonesome. He takes both horses so I can’t go anywhere besides can’t leave the place very well for the hawks and coyotes would get all my chickens. There was a bunch of Coyotes howling just outside the fence a little while ago. I took a few shots at them in the dark with the little rifle to scare them off. 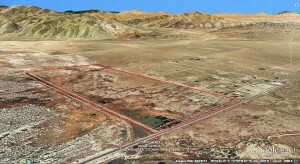 We’ll have some new neighbors a half mile north of us at the end of this month. A couple by name Anderson from Atolia, he is a skane , she American, They’ll have a hot time getting settled as the days are warm now and they have to build a house, dig a well and a hundred other things before they are anywhere near comfortable. The Aqueduct is on the bum, have closed down all their camps except two and they won’t last much longer. Cinco is getting smaller, there won’t be much left of it after a while. Lack of funds is the cause. They expect to have enough by the first of nest year to start again, but no one can tell. We did not feel that earthquake you read about. It would do me good to see all those flowers you mention. It was so dry we had none this year on the desert, but I see no way of getting to Kans.. this year either . Too bad that white goods was all gone. I think it so pretty and have tried many times to get that kind , but couldn’t, if you see any more like it get me some. Lester’s suit’s fit alright, were not too big. Heard from Edna a short time ago, she told me of her expectations. Her troubles will begin then, but I hope she will get along alright. I have no regular house cleaning time as I have to clean house every time we have a sand storm, and then it only takes me half a day. We’ve has so much wind the past two months that it is a wonder we didn’t blow away. Am glad to hear you did not have much of that cold weather and storms I read about in the papers. Is Bertha going to Institute this summer? How long does it last? Think I told all the news so I better ring off and go to bed, it is already half past nine, and I have to get up early these mornings. We are all as well as usual, hope you are too. Greetings to you all from the Jensen family. 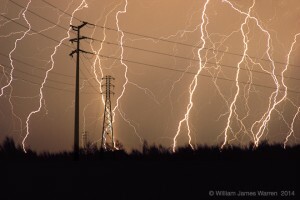 April 11, 1911: “LIGHTNING HAS SPORTY TIME ON DESERT—Burns Out Telephone System Sets Fire To House And Scares Miners—San Bernardino, April 13.—Henry Burdick was in yesterday from the Randsburg district, and tells of a peculiar electrical storm which swept the desert section Saturday. 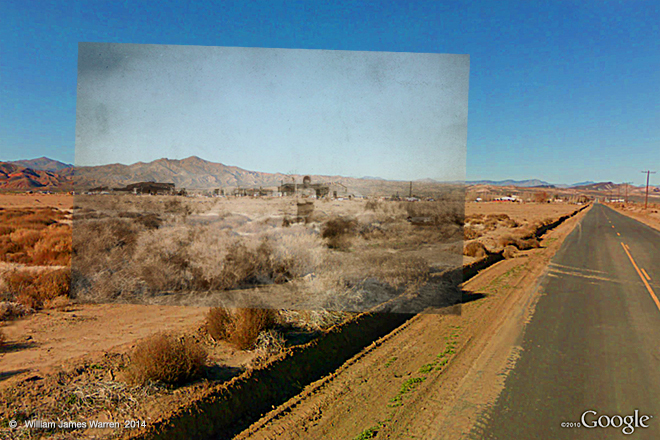 The telephone line between Randsburg and Mojave was practically put out of commission. Many poles being reduced to splinters. The family of H. P. Jensen had a very narrow escape from being electrocuted. 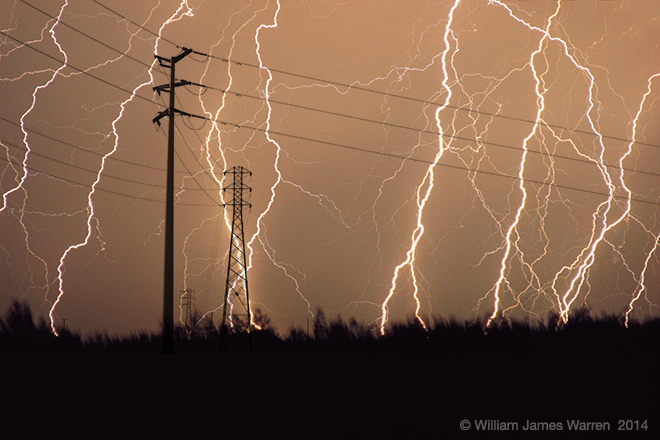 The lightning followed the telephone wires into the residence, bursting in a wave of flame in the dining room. Several newspapers placed on the telephone box ignited and for a time the house was in danger of being razed by flames. Mrs. Jensen heroically saved the structure. I better answer your letter right away otherwise it will take so long before I get at it. I owe Minnie & Edna besides several others so I need to get busy. Am sorry you haven’t been well, too bad you must work so hard. I know how it is for that is what ails me most of the time, too much work, tho’ I don’t have to bake cake for any social. Bertha better stay home once in a while and help you, shouldn’t think it would be necessary for her to go to everything. Maybe Roy would be better working on a farm, tho not as much pay. Am glad Pa is well. We’ve all had colds and Lester was sick for over a week, but seems alright again. Pete has had 3 big boils on his right wrist. The last one is still sore. I’m feeling better than I did a while back but I don’t think the desert and being alone so much is good for me. I’ll be glad if we ever get away from here. I am going away for the summer anyway. Wish it didn’t cost so much to go to Kans. I do so want to see you all and give you a taste of my kids. We’ve sold all our chickens except a dozen and our big windmill and got a small one in place of it, and as soon as Pete knows what he will do I’ll pack my trunk and go, kids and I need a change. Pete wants to go with us and take the team & wagon but we don’t know yet how it will turn out. We had a good rain over a month ago, feed will be good this year. Have had nice weather too till this week, when it’s been both cold and windy. Tried to both rain and snow, but neither amounted to anything. Pete has been home since the rain, but went down to lake today to put up a gasoline engine for pumping water at the salt vats. Don’t think it will take him over a few days. I would rather you didn’t send me any Osage paper, at least not subscribe for it yet, for the mail here is so uncertain that we don’t always get our papers and then I don’t expect to be here this summer. We all went into Mojave three weeks ago and stayed the night. I havn’t been inside a store since last August. I bought twenty-five yards of gingham to make up for my family, and I have been busy ever since trying to get it sewed up. It takes so much to around. We all need new clothes, for they wear out so fast. I cut off Louise’s hair, and she is so glad to think she is a boy. It’s Lester’s birthday tomorrow and I promised him a cake. Dorothy is so big and fat. She is papa’s girl. Well this is all for this time. Greetings to you all from the Jensen family. I expected to answer you letter right away but already four weeks have gone since I heard from you and here I’m just starting to write. I’ve been so busy since we moved to Atolia. I don’t even get time to sew. Pete didn’t get to lease Arthur’s mine for different reasons and his partner Atkinson at the Buckboard go another lease on that property in an underhanded way and left poor Pete out so we had to move and the company here has started to lease out its ground so Pete thought he’d take a chance here. He’s taken out some ore, at least enough to pay him for the work he’s done, but he may not find any more. He needed a man to help him so told Joe he could have the job as long as it lasted as work is so poor in Los Angeles. Joe boards with us and since working with pick and shovel he’s acquired a bigger appetite than Pete’s so it keeps me on the jump cooking enough to fill them up, but the kids are so anxious to be out playing with the other children they haven’t time to eat. We’ve never lived where we had near neighbors before. There is about thirty of more children here in town and was more but the company has laid off so many men lately that a good many have left. I thought I’d get to get to send Lester and Louise to school a few weeks but it closed a few days after we moved here. The Johannesburg school closed today with supper and program tonight. I didn’t feel like going in it’s so far, tho’ I may have been expected to and Royal s staying with me. Minnie and Roy went out last night to Los Angeles and San Diego, where they will meet Arthur and tend to some business affairs. They may be gone a week or more. The Kids haven’t fully recovered from the whooping cough yet. The weather is so changeable, cold and windy on day and hot the next that they catch more cold instead of getting rid of what they had. All four whooped at once after they’d gone to bed last night and I havn’t had an unbroken nights rest for two months. The last few days have been pretty hot. If it would stay awhile maybe the cough would leave. A couple days ago Louise fell off a burro and sprained her wrist, but it will be alright soon I think, anyway she won’t ride any burros for a while. I have a four roomed house here but it is so low and hot and the kitchen is unhandy. I’ve felt pretty good the past two months but the hard work is telling on me again. Pete went down to Los Angeles a couple months ago to see if he could find a place we’d like but they cost more than we have money for, so we have to stick on the desert yet awhlle. Mr. Wickard from Jobug died in Los Angeles in April. 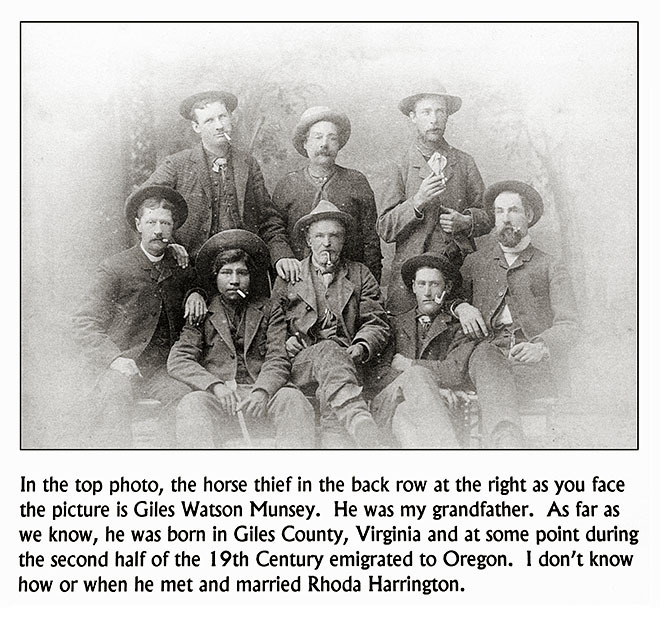 He was one of the pardners in the lease that Pete and Walton bought into more than a year ago and he & another fellow were the ones that found the ore in Arthur’s mne many years ago. He used to live in Kans., and has a sister living in Emporia and one in Baldwin. John Singleton died in Randsburg last week. He was the last of the original finders of the big yellow aster mine. Burcham died last August and Mooers died some years ago. I think Pa met Singleton when he was here. I think Rosenquist could have waited awhile. He didn’t need too get married so soon. Where is Aunt Nellie staying? I’m glad Engleholmes got their boy at last. Have they found a good enough name for him yet? Can’t think of anything more I wanted to write. Pete drove into Randsburg after supper and will be home soon. Hope this will find you all well and we all send love & greetings. 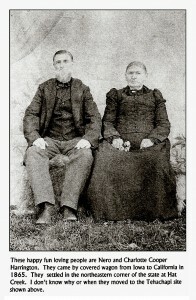 Addressed to Bertha Youngroot, 721, Main St.. Osage City, Kans. I am sending a small package by this mail with our best wishes for your birthday. It may come a little late but I forgot to mail it sooner. Hope this will find you all well. Kids aren’t over whooping cough yet. Otherwise all well as usual. We are living in Atolia now. Saw Minnie yesterday. Joe came up Wednesday to work for pete awhile. Will write letter when I get time. Your last letter was quite a long time in coming. I didn’t know but maybe you expect me to answer my own letter. I intended to write but was hindered, besides I had nothing particular to say. Edna said she had written you of our change of address. I started to answer your letter right away but didn’t get to stay with it and since then havn’t found time. It’s late now and I ought to be in bed but this is my best chance for a while. 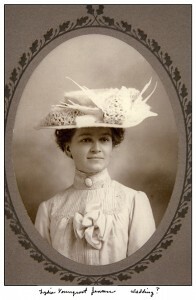 I received your pictures and think they are better than where you and Pa took to-gether but have never seen you in that style hat. Am anxious to see what Papa will look like. Doesn’t Bertha think enough of herself to have her picture taken sometime? It looks like I won’t have to go back to the desert for a while anyway. I feel better here tho there’s always something coming up to make life miserable. My teeth are starting in to give me trouble. I had to have one pulled. I need to have them all treated for pyorrhea but the dentist only wants $300 for the job, so it’s cheaper to pull them out. Pete and the kids are well outside of a cold occasionally. I finally got rid of their whooping cough. We are having warm weather this month than we had all summer. I’d rather live out in the country than in town but it’s more convenient for Pete here but I want to get a better house soon as I can. This one is no better than I had on the desert. No closets or pantry, no place to keep a thing, tho I kind of like the locality. Pete is so busy all the time that I don’t think we can come to Kansas yet a while, but he said you can come out here instead. We’ll pay your fare and look after you while here. Pete has done well since he bought his truck, but he has to put in long hours so it’s hard on him. Sometimes he’s gone all night hauling. He used to have saterdays free but lately he’s had to haul that day too. He comes home to meals any old time and I have to ready with a hand out so he can eat and go again. Between him and the kids I have to make meals all hours of the day. He brings home so much fruit and melon that it’s a wonder the kids don’t get sick eating and it makes me sick because I can’t eat all I’d like too. I also thought when I left the ranch that I wouldn’t have to stay alone nights but never can tell what you’ll get into. Kids started school tree weeks ago. Lester hours are from 8:30 to 12:30 and Louise from 9 to 2 with and hour off at noon. After school there is usually a bunch of kids playing, some of them stay and stay till I have to send them home to get rid of them. Lester has been selling papers evenings the past two weeks he makes a few cents to put in his bank. Edna and Joe were here Sunday. He walks without crutches but has to favor the ankle a good deal. He wouldn’t have got hurt if he’d stayed on top the ground where he was working and making good money. As it is he’s lucky to get the insurance money and better stay with it as long as he can for couldn’t get work here now anyway. Foley’s were to leave yesterday for New Mexico because he can’t make anything. Hilda didn’t like to leave. They never came to see us so I don’t bother about them. The Los Angeles Examiner had an advertising contest this summer (I enclose it if Bertha cares to read it). You were to save all your sales slips and send them in and those who had the most won prizes. I won two, one for fifty dollars and the other two and a half. Pete says he is going to tell everybody I won prizes for being the biggest spender in town, but it was the money he paid for the truck that brought the prize. He hauls fruit from market to some of the stores in Lankershim and tells the men on the market that he brings it home to his kids. Last Saturday he had four other kids long out to Lankershiim and told everybody they were all his. Most of them believed him and said it was no wonder he had to buy so much stuff to take home. One girl of 11 was a great big fat one. Pete said she took after me. Well Ma I’ll send you that fifty I won and another besides if you want to come out. Bertha and Pa can look after themselves till Christmas so you can stay that long. What you think about it? Pete says he has all he can do fighting me and kids without going to war I hope that is all the fighting he’ll ever have to do. There was a big peace parade here. Thursday and Sunday all the churches are going to have a rally. I think the war is awful and don’t want to read about it. It ought to bring better times for the country when they get thru fighting. Well I got to close, it’s eleven o’clock and Pete just got home and tomorrow is another busy day. Hope this will find you all well. 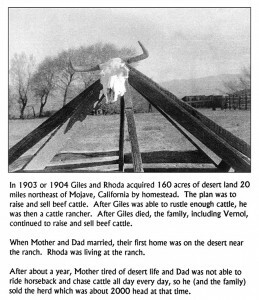 December 20, 1907: “TO GROW VEGETABLES FOR MARKET ON DESERT NEAR MOJAVE—An effort is being made to grow vegetables in the parched earth of the Mojave Desert at Desert Springs, not far from Mojave. A Los Angeles company, headed by C. Birch and L. Johnson, experienced gardeners, has taken up 100 acres of government land and are preparing to cultivate it to vegetables. They have made arrangements for water and are very hopeful for the success of the undertaking. February 18, 1923: “NOTICE FOR PUBLICATION –Department of the Interior—U.S. LAND OFFICE at Independence, California, February 14, 1923. 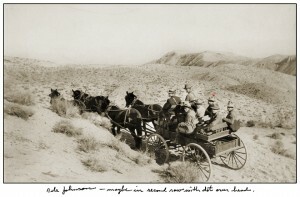 Notice is hereby given that John R. White, of Johannesburg, California, who, on March 5, 1912, made Desert Land Entry, No. 02080, northeast quarter of section 12, township 31 south, range 37 east, Mount Diablo Meridian, has filed notice of intention to make final proof under the provisions of paragraph 3 of the Act of March 1, 1915, to establish claim to the land above described, before the Register and Receiver, United States Land Office, at Bakersfield, California on the 5th day of April, 1923. 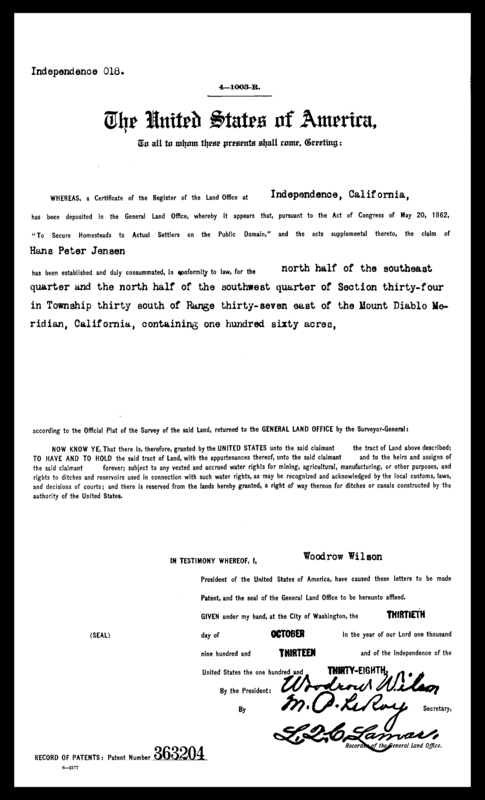 Feb. 18 to March 20, 1923, Inc.
Notice is hereby given that Mary L. White, of Johannesburg, California, who, on October 3, 1912, made Desert Land Entry, No. 03532, southeast quarter of section 12, township 31 south, range 37 east, Mount Diablo Meridian, has filed notice of intention to make final proof under the provisions of paragraph 3 of the Act of March 1, 1915, to establish claim to the land above described, before the Register and Receiver, United States Land Office, at Bakersfield, California on the 5th day of April, 1923. Election must be held at Cantil pumping station. 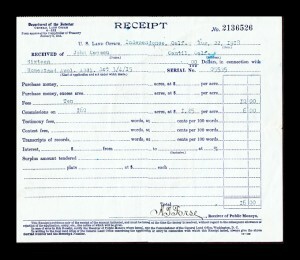 Receipt for Homestead Filing for John Cassou. Receipt states that this is for an additional Homestead. Collection of Rand Desert Museum. 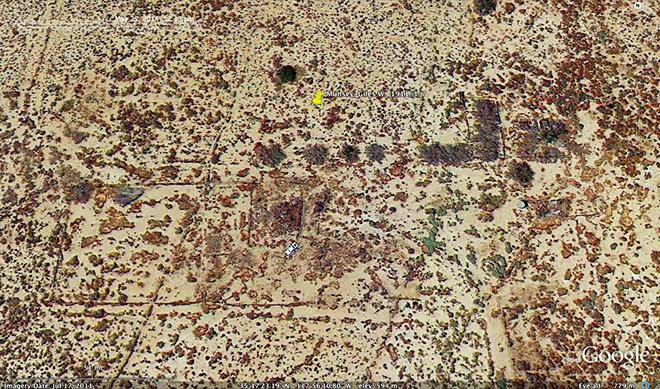 October 23, , Kess: “JOHN CASSOU is still absent from his homestead, herding cattle for Rinaldi of Randsburg. 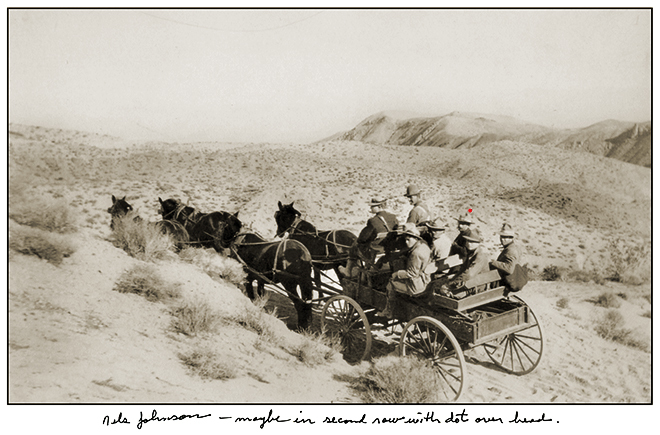 October 15, 1918: “HOLD PRELIMINARY IN COURT AT MOJAVE—Charged with burglary, the preliminary examination of Jack Harrison and William Furlong was held this afternoon before Justice of the Peace Arper at Mojave. The men were arrested on the charge three weeks ago. November 15, 1918: “TO ARRAIGN TWO ALLEGED BANDITS MONDAY MORNING—Held to answer of a charge of burglary, Jack Harrison and James Furlong will be arraigned in Department 1 of the Superior court Monday morning at 10 o’clock. Information against the men was filed today by District Attorney J. R. Dorsey. November 18, 1918: “TO ENTER PLEAS ON CHARGES OF BURGLARY—Facing a charge of burglary, Jack Harrison and James Furlong were given until Wednesday to enter pleas to the charge by Judge Mahon this afternoon in Department 1 of the Supreme court. The men are alleged to have entered a grocery store in a desert town some time ago and to have stolen several articles. They were arrested a few days later. November 20, 1918: “J. HARRISON PLEADS NOT GUILTY TO BURGLARY –Trial of Man on Charge Is Set for December 31—Stating that he was not implicated in the alleged offense in any way, Jack Harrison today entered a plea of not guilty to a charge of burglary. His trial before a jury was set for December 31, in Department 1 of the Superior court. James Furlong, who, it is alleged, admitted that he entered a store with Harrison for the purpose of burglarizing the place, pleaded guilty to the charge yesterday and asked for probation. The men are charged with having robbed a store at a desert town. They were arrested by several citizens the next morning a few miles from the town, it is said. 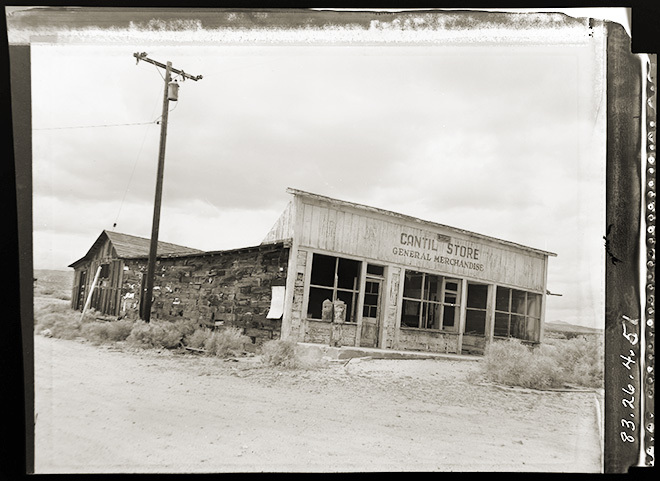 June 10, 1919: “JACK HARRISON ON TRIAL FOR BURGLARY—The trial of Jack Harrison, charged with burglarizing the Andrews store at Cantil on the desert, was continued this morning until the afternoon in order to permit the attorney to submit affidavits which would support a further continuance. 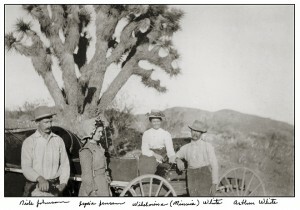 June 12, 1919: PROSECUTION RESTS IN HARRISON CASE—The prosecution rested yesterday in the trial of Jack Harrison, former Johannesburg liquor dealer and an old resident of the desert on the charge of burglarizing the store of Andrew Miller at Cantil, and the case was continued until tomorrow morning when the defense will start to introduce evidence. 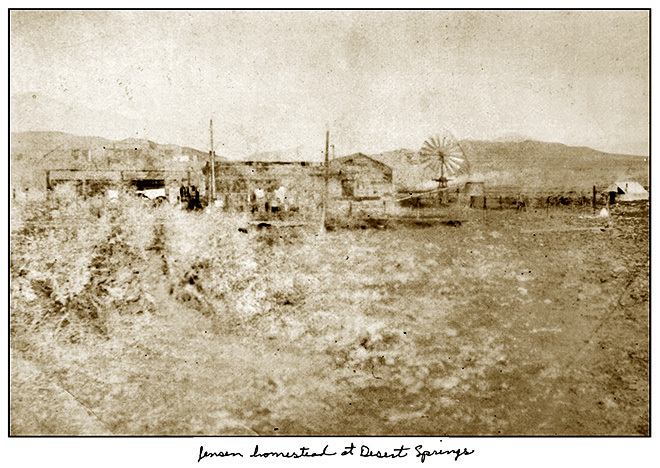 June 13, 1919: “CHARACTER WITNESSES APPEAR FOR HARRISON –A large number of character witnesses were placed on the stand today by the defense of Jack Harrison, a well-known desert resident, who is on trial in Department 3, Superior court, for the robbery of Andrew Miller’s store at Cantil. 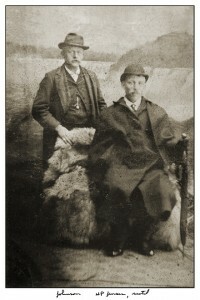 Harrison is said to have driven his car to Miller’s store with James Furlong one night, loaded the machine with merchandise and driven off with it. Furlong plead guilty and escaped later from the county jail. 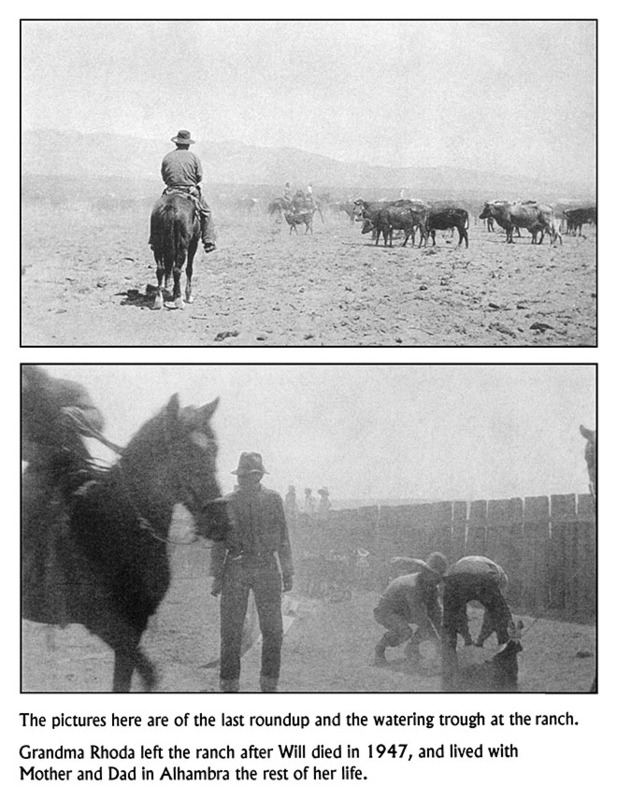 June 14, 1919: “JURY FAILS TO AGREE IN HARRISON CASE—The jury in the trial of Jack Harrison, well-known desert resident, on the charge of robbing the store of Andrew Miller at Cantil, disagreed late yesterday, after deliberating three hours and a half. Ten voted for acquittal and two for conviction. Harrison was alleged to have taken his machine and gone with James Furlong to Miller’s store in the night, filled it with merchandise and left. Furlong pleaded guilty, but escaped from the county jail. Harrison claims that he merely loaned Furlong his can and did not know for what purpose Furlong wanted it. September 16, 1911: “PROSPECTOR NOW HAS LONELY VIGIL –Sudden Death of Wife Leaves John Davis Alone in Cabin—Mrs. Martha Davis, who died suddenly on her husband’s ranch six miles from Cinco, was buried yesterday afternoon at Tehachapi, the funeral being conducted by the Eastern Star Lodge of which Mrs. Davis was a member. 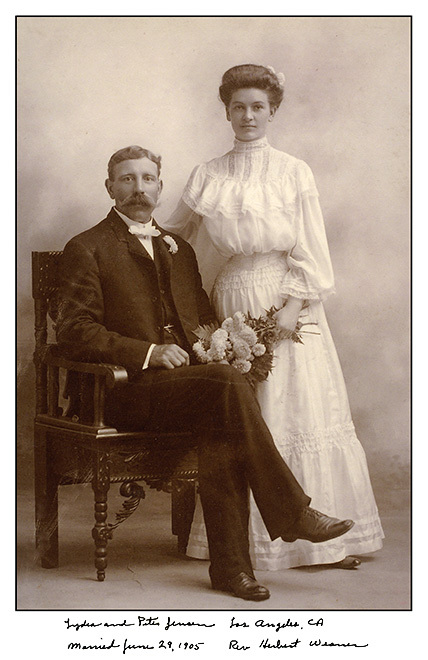 She was the wife of John T. Davis, two of whose children are Frank Davis, yardmaster of the Santa Fe railroad in this city, and Ezra T. Davis of the Bakersfield Fire Department. The sons with their wives were present at the funeral service and burial. 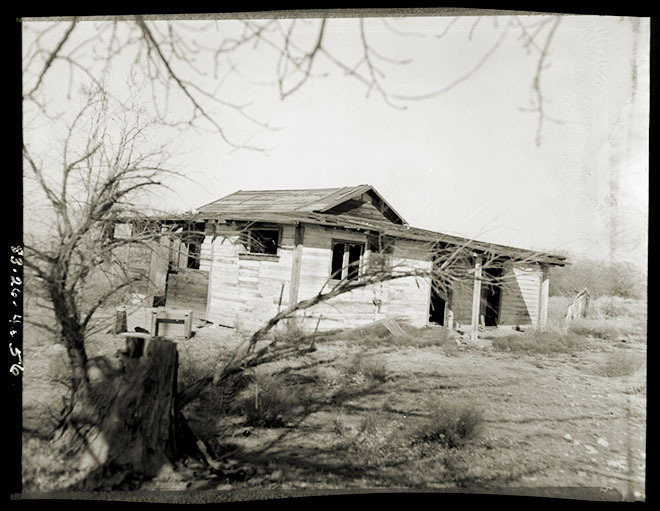 The circumstances attending the death of Mrs. Davis were peculiarly distressing. 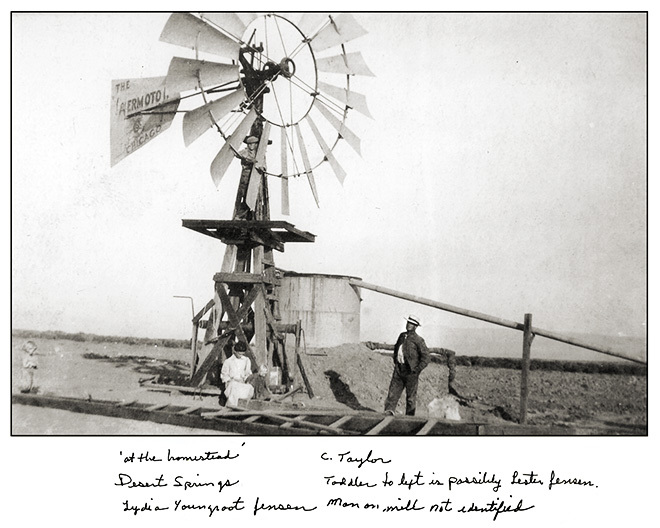 Her husband who is aged, had taken up desert land homestead claims, and the couple had put in four years in hard development work, succeeding splendidly. One more year’s residence was required to prove up on the claim. The Davises who had a nice home, but their nearest neighbor, Mrs. Munsey, mother of E. Porter Munsey of the Kern Valley Garage, was more than a mile away. 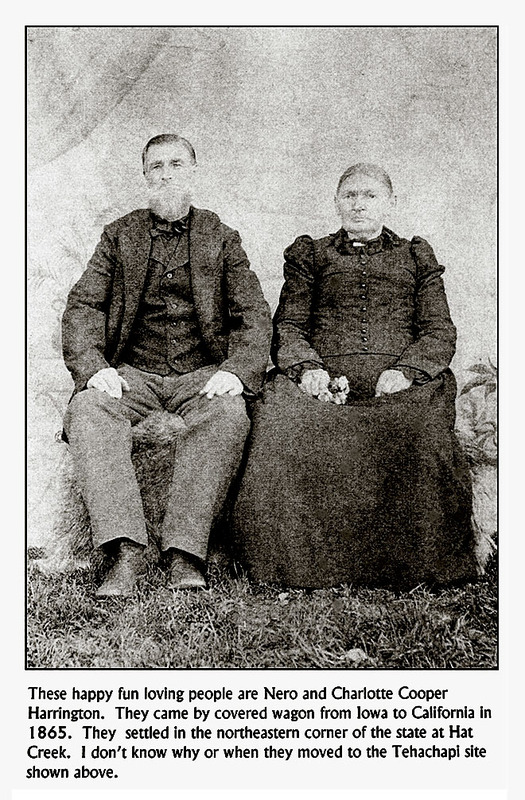 When Mrs. Davis fell ill her husband devoted himself entirely to waiting upon her. She was sitting in a chair and he was bathing her brow when she exclaimed, “I feel like I’m smothering.” A moment later she was dead. Mr. Davis, who is 80 years of age, made his way to Mrs. Munsey’s house. 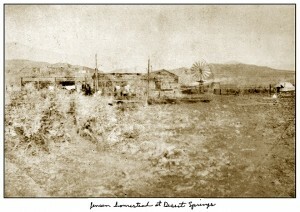 She and other settlers took matters in charge and notified the Davis boys in Bakersfield. 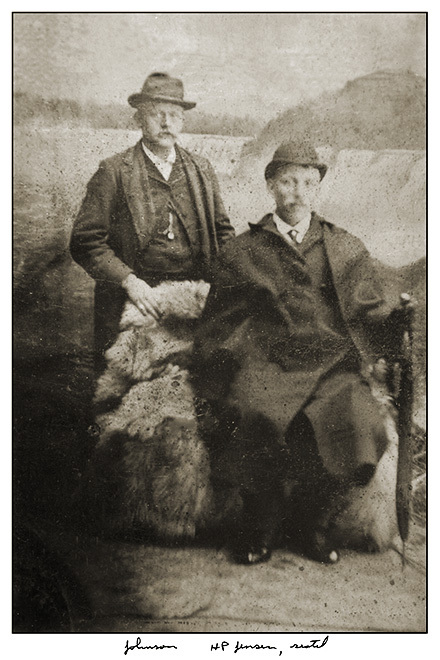 They, with their wives and Deputy Coroner A. H. Dixon, made the trip over the mountain in an auto in six hours, traveling by night and covering more than 100 miles in six hours. They arrived there at 5 a. m.
A jury was empaneled and soon found that Mrs. Davis’ death was due to heart disease superinduced by pneumonia. The jurors were C. W. Lamont, H. P. Jensen, Frank Marion, Moser Hadlock, Hiram Reed and G. W. Munsey. May 28, 1915: “BLOOMFIELD HAS FINISHED a fine 12 inch well for Wm. March 24, 1916: “NEURALIA NOTES—A general clean-up is being made in and around Hotel Oasis. It is rumored that the property of J. H. Hicks, where the post office is located, will undergo the same process, including an overhauling of the pumping plant. This work is certainly commendable, and if every homesteader and rancher will keep his place neat and orderly it will go a long way toward helping the country. 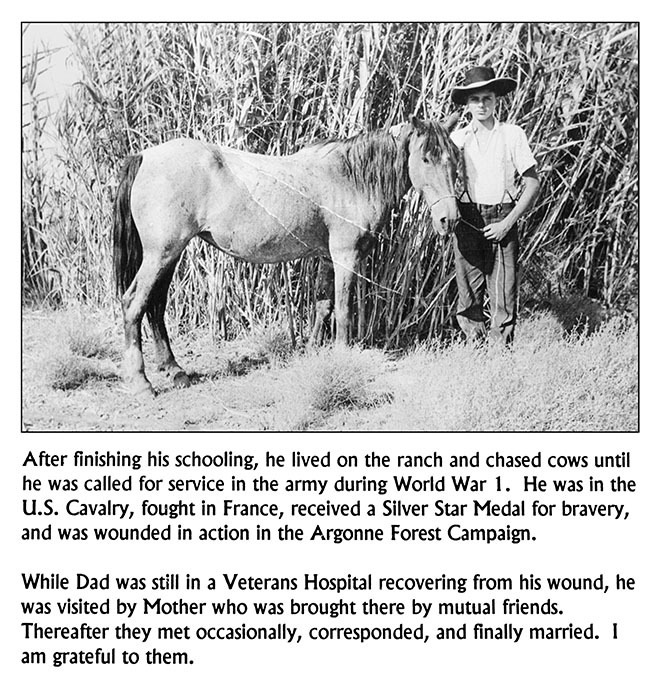 May 28, 1915: “BOSCO” JOE IVERSON rode horseback to Butterbread Springs Saturday, returning Sunday. He was a little stiff necked for a few days from his jaunt. Notice is hereby given that John J. Hill of Neuralia, California, who on October 10th, 1914, made homestead entry, No. 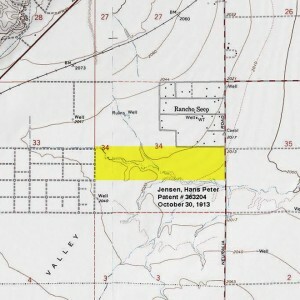 03989, for NW ¼ section 12, township 32 South, Range 36 East, Mount Diablo Meridian, has filed notice of intention to make final Commutation proof, to establish claim to the land described before I. L. Miller, County Clerk of Kern County, at Bakersfield, California, on the 7th day of February, 1916. Daniel P. Cole, Edwin M. Chester, Anne Ryall, James Ryall, all of Neuralia, Cal. This entry was posted in Fremont Valley, Fremont Valley Homesteads / Land Patents. Bookmark the permalink.